Now this is the genealogy of the sons of Noah: Shem, Ham, and Japheth. And sons were born to them after the flood. The sons of Japheth were Gomer, Magog, Madai, Javan, Tubal, Meshech, and Tiras. The sons of Gomer were Ashkenaz, Riphath, and Togarmah. The sons of Javan were Elishah, Tarshish, Kittim, and Dodanim. From these the coastland peoples of the Gentiles were separated into their lands, everyone according to his language, according to their families, into their nations. Anthropologically and ethnologically speaking, this is one of the most important documents in man's possession today. It records the earliest lines of the human race. The biblical scholar, H. S. Miller, tells us that 70 nations are found in this account ... all of which came from Noah's three sons. I believe these boys were triplets, Japheth being the first born (Gen. 10:21). From Magog ... the Scythians, Slavs, Russians, Bulgarians, Bohemians, Poles, Slovaks and Croatians. From Madai ... the Indian, Iranic, Mede, Persian, Afgan and Kurdish peoples. From Javan ... the Romance peoples, the Greeks, Romans, French, Spanish, Portuguese and others. From Tiras ... the Thracians, Teutons, Germans, Angles, Saxons and Anglo-Saxons. In general, these were the light skinned and European peoples whose territories ranged from the Caspian Sea to the Atlantic Ocean. The sons of Ham were Cush, Mizraim, Put, and Canaan. The sons of Cush were Seba, Havilah, Sabtah, Raamah, and Sabtechah; and the sons of Raamah were Sheba and Dedan. Cush begot Nimrod; he began to be a mighty one on the earth. He was a mighty hunter before the LORD; therefore it is said, "Like Nimrod the mighty hunter before the LORD." And the beginning of his kingdom was Babel, Erech, Accad, and Calneh, in the land of Shinar. From that land he went to Assyria and built Nineveh, Rehoboth Ir, Calah, and Resen between Nineveh and Calah (that is the principal city). Mizraim begot Ludim, Anamim, Lehabim, Naphtuhim, Pathrusim, and Casluhim (from whom came the Philistines and Caphtorim). Canaan begot Sidon his firstborn, and Heth; the Jebusite, the Amorite, and the Girgashite; the Hivite, the Arkite, and the Sinite; the Arvadite, the Zemarite, and the Hamathite. Afterward the families of the Canaanites were dispersed. And the border of the Canaanites was from Sidon as you go toward Gerar, as far as Gaza; then as you go toward Sodom, Gomorrah, Admah, and Zeboiim, as far as Lasha. These were the sons of Ham, according to their families, according to their languages, in their lands and in their nations. Thirty nations are found in the descendants of Ham. They were dark skinned peoples, the majority of which lived south of Palestine. Ham has been handed a "bad rap" by many. But, it should be noted that from him came two of the world's earliest and greatest civilizations ... namely, the Egyptians and the Babylonians. The greatest personality among Ham's descendants was Nimrod. We are told he was a mighty hunter before the Lord. His reputation was so great that he became a legend among early mankind. They even had a saying about him ... like Nimrod the mighty hunter before the Lord. 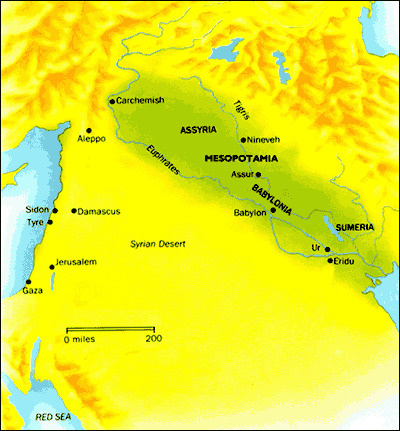 He was the founder of the cities of Babel and Nineveh which become the capital cities of Babylon and Assyria. And children were born also to Shem, the father of all the children of Eber, the brother of Japheth the elder. The sons of Shem were Elam, Asshur, Arphaxad, Lud, and Aram. The sons of Aram were Uz, Hul, Gether, and Mash. Arphaxad begot Salah, and Salah begot Eber. To Eber were born two sons: the name of one was Peleg, for in his days the earth was divided; and his brother's name was Joktan. Joktan begot Almodad, Sheleph, Hazarmaveth, Jerah, Hadoram, Uzal, Diklah, Obal, Abimael, Sheba, Ophir, Havilah, and Jobab. All these were the sons of Joktan. And their dwelling place was from Mesha as you go toward Sephar, the mountain of the east. These were the sons of Shem, according to their families, according to their languages, in their lands, according to their nations. These were the families of the sons of Noah, according to their generations, in their nations; and from these the nations were divided on the earth after the flood. Twenty-six nations are found among the descendants of Shem. They comprise the Semitic, Oriental and Mongoloid peoples. Eber is thought to be the grandfather of Abraham. It was probably from him that the name Hebrew (Eberooo) was derived. Take special note of this man, Peleg, here. His name comes from the Hebrew word palag ... meaning split or divide. His father, Eber, gave him that name because, as our text says here, in his days the earth was divided. This statement is also found in the genealogy in First Chronicles 1:19, as well. In the early 1900's, geologists became aware that all the continents of Earth were originally together in just one large landmass. This has been the clear biblical presentation all along, by the way, as found in the creation account in Genesis 1. At a conference in 1926, they named this original super continent Pangaea. According to them, millions of years ago that original single landmass broke up and its pieces drifted apart forming the continents that we know today. There is evidence here in Genesis, however, that the breaking up of Pangaea actually occurred in relatively recent human history around 4500 years ago. I believe that is what is referred to here that took place during the days of Peleg ... and ... after which he was named. Doubtless, it was quite a shock to mankind when the earth began to divide. Eber's world, suddenly and drastically, began to pull apart. Some creationists object to this interpretation, however, insisting that it would have necessitated enormous earthquakes, tsunamis and other immensely destructive effects. However, if this dividing of the earth took place under the superintending hand of God (as seems to be implied here), ... then, the destructive effects that would ordinarily accompanying such an event could have been greatly minimized ... if not eliminated altogether. The simple straight-forward way that it is presented to us here in the Word of God seems to indicate that that was the case and, I believe, that is just what happened. The humans of Eber's day must have looked on in utter amazement as the widening gaps between landmasses became more and more distant and the receding shorelines could no longer be seen. Obviously, God had a great purpose for these monumental changes in Earth's topography. You will remember that it was his desire that men should populate the whole Earth. This event would certainly have been one major factor in insuring that objective. 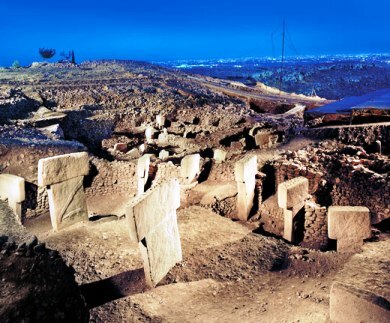 It may also be the best explanation for a multitude of mysterious similarities between, say, the Aztec pyramids of South America and the Egyptian pyramids of North Africa, as well as a plethora of other similarities in peoples, architectures and mores that are found on all the different continents today. In addition, the dividing up of Pangea into today's separate continents set the stage for the various nations and empires that God had preordained for the earth. Now the whole earth had one language and one speech. And it came to pass, as they journeyed from the east, that they found a plain in the land of Shinar, and they dwelt there. Then they said to one another, "Come, let us make bricks and bake them thoroughly." They had brick for stone, and they had asphalt for mortar. And they said, "Come, let us build ourselves a city, and a tower whose top is in the heavens; let us make a name for ourselves, lest we be scattered abroad over the face of the whole earth." It is always predictable that sinful men can be counted on to do the exact opposite of the will of God. God told Noah to be fruitful, and multiply, and fill up the earth (9:1). To obey, however, man would have to agree to divide up. However, these descendants of Noah had no intention of doing that. Rather, they proceeded to do the exact opposite. They plotted to stay together lest they become scattered abroad over the face of the whole earth (11:4). May we "chase a rabbit" here for a moment? The essence of sin is utter independence from God. It's independence on steroids. It's, I did it my way, as the song so proudly trumpets. The essence of spirituality, however, is quite the opposite. It is characterized by utter, humble dependence on God. These Tower of Babel folks said, We're gonna do this ... and ... We're gonna do that. We're gonna build ourselves a city ... and ... We're gonna make a name for ourselves. And, like most people today, the kind of thinking found in Colossians 3:17, never crossed their minds. Come now, you who say, "Today or tomorrow we will go to such and such a city, spend a year there, buy and sell, and make a profit"; whereas you do not know what will happen tomorrow. For what is your life? It is even a vapor that appears for a little time and then vanishes away. Instead you ought to say, "If the Lord wills, we shall live and do this or that." But now you boast in your arrogance. All such boasting is evil. The Proud ... such were the people who set out to build the Tower of Babel. But they were in for a big surprise. But the LORD came down to see the city and the tower which the sons of men had built. And the LORD said, "Indeed the people are one and they all have one language, and this is what they begin to do; now nothing that they propose to do will be withheld from them. Come, let us go down and there confuse their language, that they may not understand one another's speech." So the LORD scattered them abroad from there over the face of all the earth, and they ceased building the city. Therefore its name is called Babel, because there the LORD confused the language of all the earth; and from there the LORD scattered them abroad over the face of all the earth. When we read, the Lord came down to see the city, we are not reading that he had to come down to find out what was going on. Rather, we are reading that the Lord actually did come down, in bodily form, to personally inspect the city that the descendants of Noah were building. Our God is a hands on God, you see. I believe this was yet another pre-incarnate appearance of the Lord Jesus Christ. Again, theologians call these appearances theophanies. After his personal inspection, the Lord decided to supernaturally intervene at Babel, so that his will for the human race would continue to be carried out. Instantaneously, he created the basis for the wide variety of human languages that we find on Earth today ... implanting them into the individual minds of the men of Babel as he saw fit. 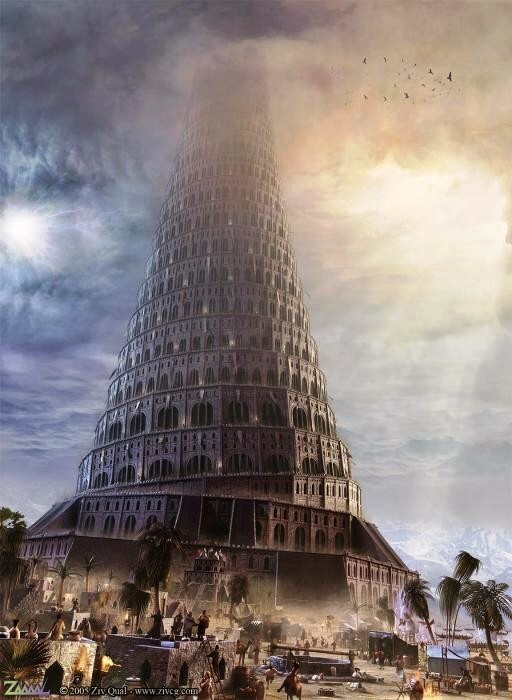 As a result, the inhabitants of Babel could no longer understand one another, much less work together, and they were forced to separate and scatter over the earth as they had been originally commanded. This is the true origin of human languages. Later, these people were further divided by the physical pulling apart of their world during the days of Peleg, as we previously discussed. By the way, the Lord's words here, let us go down and confuse their language, is another allusion to the Trinity. We first encountered this kind of expression back in 1:26, where we read, And God said, 'Let us make man in our image'. 1. 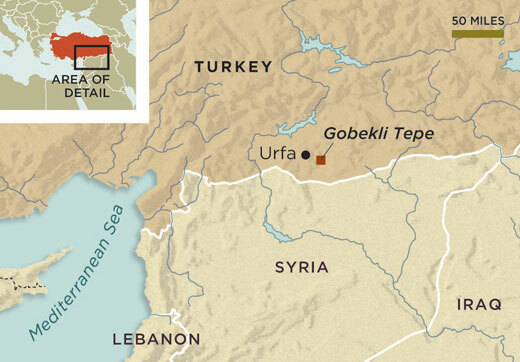 It is in the right area ... some 400 miles east of Mount Ararat, it is just where you would expect the remains of the Tower of Babel to be. The biblical text says as people moved eastward they found a plain in Shinar. (NIV). This gives us the general location for the Tower of Babel. Shinar is an ancient name that has a long history. The name has an etymology of many nuances and interpretations. 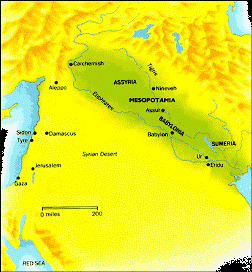 Later in history, it became the name for the land of the Babylonian empire. The Old Babylon Period is dated from 2000 to 1595 BC; the Middle Babylonian Period from 1595 to 1000 BC; and the Neo-Babylonian Period from 1000 to 539 BC. Gobekli Tepe is located at the northern end of the ancient land of Shinar. 2. It is post-Flood ... the earliest known site of a coordinated, large scale, construction by humans. 3. Its multitude of stone carved animals, birds and insects adorning its pedestals, point to Noah's immediate descendants from the ark. 4. It was built atop a hill ... 1000 feet above the valley floor below. Obviously, intended to be impressive and visible for miles around. 5. It was deliberately covered over before it was totally abandoned. This is one of its greatest mysteries. Why would its builders cease construction and then go to all the effort of hauling tons of earth and rock to cover over their previous work? May I suggest that they did so out of fear? They covered it up because, after God's powerful intervention, they were terrified to proceed with their tower. And ... thinking they might provoke God's anger even further ... they fearfully took it down and buried it! That certainly is a more plausible explanation than the History channel's alien construction hypothesis, is it not? 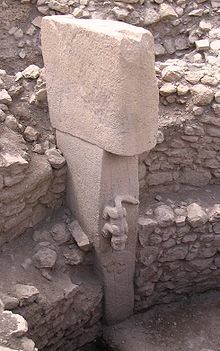 Pictures of the Gobekli Tepe site can be found at: http://bit.ly/Gobekli_Tepe. Carbon dates, by the way, are not set in stone. There are many variables and assumptions that can throw a carbon date off. Therefore, dates obtained by carbon dating should be carefully examined, both as to the methodology and the assumptions that were used in arriving at them. A good article on this subject can be found at: http://bit.ly/Carbon_dating. From our study of Genesis 5, we learned that the Flood ended around 2619 BC. This gave mankind up to 600 years or so to repopulate the earth before the time when the Tower of Babel began to be built. Determining the actual population numbers of those early men is difficult because there are so many variables, not the least of which was the fact that they lived far longer than we do. Calculating their number at the end of 600 years ... beginning with only 8 people and a growth rate of 0.02 ... their number would have increased to 1,133,947. If we calculated their number after 300 years with a growth rate of .035, their number would have been 234,560. If you would like to work with the figures for yourself, go to: http://bit.ly/PopulationProjection. 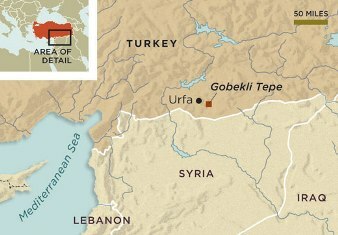 Below are modern and ancient maps of the ancient land of Shinar and the present location of Gobelki Tepe. It is at the northern end of the ancient territory of Shinar. This is the genealogy of Shem: Shem was one hundred years old, and begot Arphaxad two years after the flood. After he begot Arphaxad, Shem lived five hundred years, and begot sons and daughters. Arphaxad lived thirty-five years, and begot Salah. After he begot Salah, Arphaxad lived four hundred and three years, and begot sons and daughters. Salah lived thirty years, and begot Eber. After he begot Eber, Salah lived four hundred and three years, and begot sons and daughters. Eber lived thirty-four years, and begot Peleg. After he begot Peleg, Eber lived four hundred and thirty years, and begot sons and daughters. Peleg lived thirty years, and begot Reu. After he begot Reu, Peleg lived two hundred and nine years, and begot sons and daughters. Reu lived thirty-two years, and begot Serug. After he begot Serug, Reu lived two hundred and seven years, and begot sons and daughters. Serug lived thirty years, and begot Nahor. After he begot Nahor, Serug lived two hundred years, and begot sons and daughters. Nahor lived twenty-nine years, and begot Terah. After he begot Terah, Nahor lived one hundred and nineteen years, and begot sons and daughters. Now Terah lived seventy years, and begot Abram, Nahor, and Haran. Here, the writer records the line of Shem, through whom Messiah would come. Notice that, like the genealogy found in chapter 5, this is also an interlocking genealogy. Interlocking genealogies insure the exact record and age of each person involved. In all, eleven generations are recorded here, and we will find that longevity, after the Flood, has now been cut in half. During the 365 years that this genealogy covers, if each man had 8 children, and each of his children had 8 children, and so on ... by the time of Abraham, the population of the earth would have been around 100 million. This is the genealogy of Terah: Terah begot Abram, Nahor, and Haran. Haran begot Lot. And Haran died before his father Terah in his native land, in Ur of the Chaldeans. Then Abram and Nahor took wives: the name of Abram's wife was Sarai, and the name of Nahor's wife, Milcah, the daughter of Haran the father of Milcah and the father of Iscah. But Sarai was barren; she had no child. And Terah took his son Abram and his grandson Lot, the son of Haran, and his daughter-in-law Sarai, his son Abram's wife, and they went out with them from Ur of the Chaldeans to go to the land of Canaan; and they came to Haran and dwelt there. So the days of Terah were two hundred and five years, and Terah died in Haran. We come now to a very important turning point in the book of Genesis. Up to this point, we have studied four events: The Creation, The Fall, The Flood and The Tower of Babel. Now, Genesis will take up four persons: Abraham, Isaac, Jacob and Joseph. Here, at the end of this genealogy, we come to this man, Abram. His name means father. Later, God will change his name to Abraham, which means father of a multitude. Terah was Abraham's dad and he had three boys. Again, I believe these boys were triplets. One of them, Haran, died before Abram's family left their home of origin in Ur of the Chaldees. In those days, they were just a family of idol worshipers. Yet, God called to Abram and Abram responded ... believing God ... and thereby, for all time, became the father of all who trust and believe in the true and living God. As you have it later in the book, And Abraham believed God and it was counted to him for righteousness (15:6). Furthermore, it was from Abraham that God raised up a people for his name's sake ... namely, the Jewish people, who would come into being through Abraham's grandson, Israel (Jacob). Abraham fathered the Arabic peoples, as well, through his son Ishmael. In addition, it was to Abraham, and his covenant descendants, through Isaac, that the land of Palestine was given to the Jewish people by God as an everlasting possession (13:15). And last, but not least, it was to Abraham that the promise of Messiah was given ... promising that through his Seed, all the nations of the earth would be blessed (26:4). So, at this point, God's Word will now take up this remarkable saint, Abraham. Abraham is very, very special in the history of God's dealings with mankind.